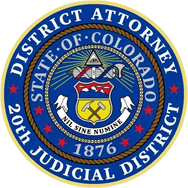 The overarching goal of the Boulder District Attorney’s Office is to seek justice in every case. In pursuit of that goal, the Boulder District Attorney’s Office established the Conviction Integrity Unit (CIU) in 2018 to investigate wrongful conviction clams. Upon request, the CIU will review each claim in order to identify and rectify cases in which an individual was wrongfully convicted. The mission of the CIU is to review legitimate claims of actual innocence. The CIU is composed of members representing the University of Colorado Law School, Alternative Defense Counsel, and the Boulder District Attorney’s Office. This collaborative approach seeks to ensure a fair review of all clams by a group of attorneys and investigators with differing perspectives from within the criminal justice system. The CIU process is completely independent of an previously filed or ongoing post-conviction litigation or appellate filings, and seeks to further the interest of justice by ensuring that every claim of actual innocence is being diligently reviewed and investigated. The claim must not be frivolous. For more information on the Conviction Integrity Unit, contact us at (303)441-3700.